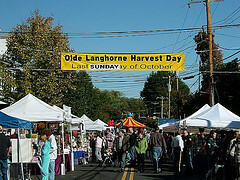 Langhorne began in the 17th century as a crossroads called Four Lanes End. The road from Bristol to Durham intersected with the road between Philadelphia and Trenton at the center of the village. These two roads were originally Lenni-Lenape Indian paths that later became known as Maple Avenue and Bellevue Avenue after developing into roads. In the 1720s, Joseph Richardson settled and eventually opened up a general store and inn at the crossroads. Langhorne continued to grow into a very important transporation center between Trenton and Philadelphia in the later eighteenth century and nineteenth century. Langhorne eventually became the stagecoach transportation hub of Bucks County, transporting people between Trenton and Philadelphia. The village became known as Attleborough until 1876, when it was incorporated and named for Jermiah Langhorne, an early resident of the area and former chief justice of the Pennsylvania Supreme Court. In the late nineteenth century and early twentieth century, Langhorne continued to grow as wealthy Philadelphians constructed large homes and businesses along Maple and Bellevue Avenue. The name "Langhorne" is also used broadly to include the surrounding township.